Nosebleeds can be dramatic and frightening. Fortunately, most nosebleeds are not serious and can usually be managed at home, although medical intervention may sometimes be necessary. Exposure to warm, dry air for prolonged periods of time. “When it is hot, the blood vessels that are already near the surface dilate or expand to get rid of excessive heat. This, too, can cause nose bleeding,” explains Dr Henry Nderitu, a general physician in Nairobi. This also applies to people suffering from malaria, which causes fever. The blood vessels consequently, move closer to the surface to get rid of excess heat. Nasal foreign body (object stuck in the nose). Vigorous nose-blowing. "These vessels break easily whenever we sneeze or blow our nose with vigour. When people have a cold, they tend to blow their nose frequently, which can also rapture the vessels, causing nose bleeding,” explains Dr Kesenwa. Deviated or perforated nasal septum. The use of certain medication that may thin the blood. 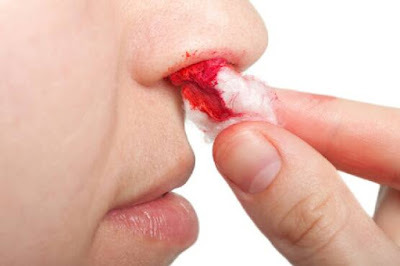 Although the above explained causes of nose bleeding need not raise alarm, sometimes a nose bleed can be an indicator of an underlying health problem. “There are two main explanations for nose bleeding: It can indicate to a health issue that is either local or systemic,” says Dr Kesenwa. By local, it means that the problem is around the nostril, while systemic means it’s spread beyond the nasal area. A systemic disease is one that affects most, if not, all of the body organ systems simultaneously. When nose bleeding is an indication of a systemic problem, it could be due to an upper respiratory infection such as a cold or flu. “Nose bleeding associated with flu usually resolves itself and there is no cause for concern,” says Dr Nderitu. Mix some onion with a little pure honey and use externally as treatment for nasal bleeding. Make a decoction of the flowers and leaves.